Remember the budget-friendly BlackBerry Curve 9320 that was announced a couple of months ago? Its CDMA variant known as the BlackBerry Curve 9310 is coming to Verizon in just a few short days. The handset is oriented towards first time smartphone users that want to stay connected to friends and family via social networks even when they are out and about. Needless to say, BBM comes installed on the BlackBerry Curve 9310, and to make the experience even more pleasant, the smartphone is equipped with a dedicated BBM button on the side. Clients for Facebook and Twitter are on board as well, and that hardware QWERTY keyboard should come in handy when typing those long emails and wall posts. VZ Navigator comes pre-loaded bringing free, turn-by-turn navigation to Curve 9310 owners. In terms of hardware, there isn't much that can make the BlackBerry Curve 9310 shine. It comes with a 2.44-inch, QVGA non-touchscreen display and a 3.2-megapixel camera. Wi-Fi and GPS are included as well, and the microSD card slot can accommodate cards of up to 32GB in size. As far as pricing goes, the BlackBerry Curve 9310 will set you back $50 after a $50 mail-in rebate, as long as you don't mind signing a 2-year contract with Verizon. Speaking of contracts, getting the handset requires a subscription to a Share Everything plan, which starts at $80 monthly and includes unlimited talk, texts, and 300MB of data. 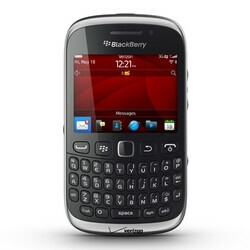 BASKING RIDGE, N.J. and WATERLOO, Ontario, July 10, 2012 /PRNewswire/ -- Verizon Wireless and Research In Motion (RIM) (NASDAQ: RIMM; TSX: RIM) today announced the BlackBerry® Curve™ 9310 smartphone, a stylish new smartphone for socially-connected customers. The BlackBerry Curve 9310 is a slim and easy-to-use smartphone ready to help customers make the move from a basic phone to a smartphone. It includes all the core BlackBerry messaging and social-centric applications that let customers easily connect to the people and things that matter most to them. Running on BlackBerry 7.1, the Curve 9310 also features the iconic BlackBerry keyboard for quick and easy typing and a dedicated BBM™ key for instant access to RIM's popular mobile social network. The new BlackBerry Curve 9310 smartphone will be available online at www.verizonwireless.com starting July 12 and will be in Verizon Wireless Communications Stores in the coming weeks for $49.99 after a $50 mail-in rebate with a new two-year customer agreement. Customers receive the rebate in the form of a debit card; upon receipt, customers may use the card as cash anywhere debit cards are accepted. This is by far the best phone released in 2008. Even that may be an exaggeration. What's the difference between this curve and the others? Lol. It doesn't even have LTE. Why, oh why, does RIM even bother releasing such a phone??? They never cease to astound me. To set the record straight, you do not have to get a Share Everything plan if you are upgrading. You only have to get a Share Everything plan with this device if you are a new Verizon customer. Sorry, ShiftMobile said already. Solid correction...PArena should have fig. that out. Or skip VZ plans all together, buy it at retail price and use PagePlus for unlimited Talk/Text and 2GB of data for $55/mo. Remember when VZW charged 10 bucks a month for a Media Phone. This share plan will do the same too. It's not that good of a deal. IF I want the BB, it's an upgrade, no Share everything plan. Plus, what if a single VZW subscriber wanted it?? can't they pick a min plan, txt plan and 2G of data?